My regular powder foundations are formulated with mild oil control capabilities and are perfect for dry skin, or for those with dry & oily patches. I have severely dry skin, and I was always disappointed how minerals looked flaky and obvious on me. 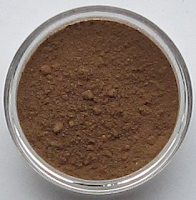 My goal was to make a blend that absorbs enough oil to look fresh without over drying. 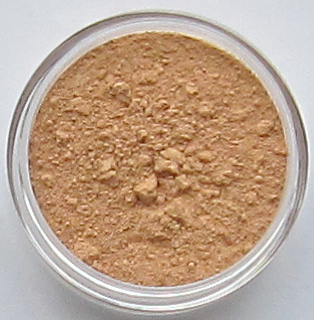 Our mineral foundations come in 30g jars, which last 2-3 months for most regular users. Our samples are 1/4 teaspoon in a labeled, sealed baggie. 3-4 applications. 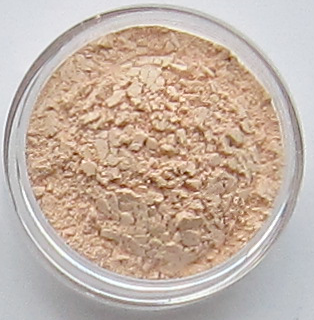 Our minerals are blended at a low speed for a silky application and luxurious texture. Our mineral foundations are suitable for all skin types. Dry/Normal Skin: The foundation alone should provide enough coverage with 2 applications. 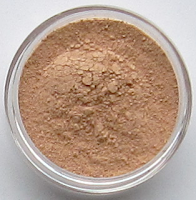 Oily Skin: After 2 applications of foundation follow with a finishing powder to control moderately oily skin. To manage extremely oily skin use either a primer of serecite, Mattifier, kaolin or finishing powder on your target areas before applying foundation, then finish with a finishing powder all over. Our mineral foundations offer light to medium coverage with a satin (semi-matte) finish. Our mineral foundations have light refracting properties, helping to disguise skin discolorations, redness, dark eye circles, and fine lines. 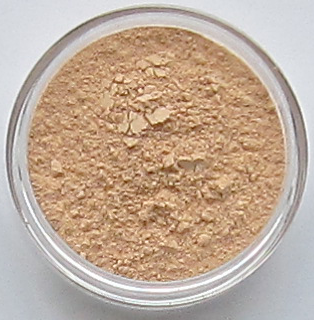 How Do I Choose A Mineral Foundation Color? Knowing where to start your color search can seem daunting but it's actually quite easy. The most accurate test you can do is this: Lay your arm on a piece of plain white paper in natural sunlight. You should be able to see a distinct undertone. Yellow: If you see only a yellow undertone (no pink), you are a warm. Your veins will appear green. Pink: If you see only a pink undertone (no yellow), you are a cool. Your veins will appear blue. Both: If you can't decide because you see both yellow and pink, you are a neutral. Your veins will appear green, blue, or even purple. Neutrals are great, and many women have this undertone. Neutral foundations will find whichever color (yellow or pink) is prominent and they will build on that. What If The Color Doesn't Match Me Exactly? 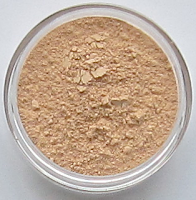 One of the best features of mineral foundation is its sheer versatility. 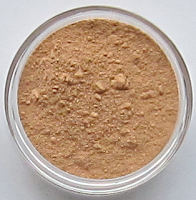 The color doesn't have to be an exact match because you are never putting a mask on, like with liquid foundation. Mineral makeup builds on your natural skin tone, allowing it to shine through. 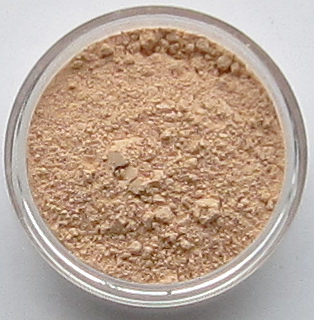 As long as your mineral foundation color is close to your natural tone it will blend seamlessly. You can also mix and match colors to achieve the perfect color for your skin. 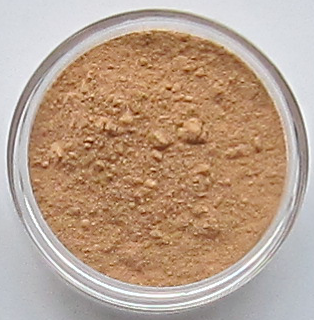 Choose the two colors closest to your skin tone and mix them in a separate container until you achieve perfection. It only takes a little shake to mix them; no tools! 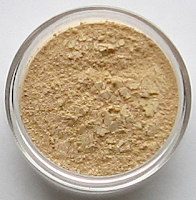 Don't forget to try our translucent finishing powders - they'll control a little shine and even out faint discolorations. Ingredients: Mica, Rice Powder, Titanium Dioxide, Zinc Oxide, Silica, Iron Oxides. May contain Chromium Oxide Green, Ultramarine Blue, Manganese Violet. Bare- Light to Medium Neutral Skin; "Peaches & Cream"
Naked- Medium Neutral Skin; "Peaches & Cream"
Buff- Medium to Deep Neutral Skin; "Peaches & Cream"
Thank you, Lynn. I love Beauty Bliss. It’s a pleasure to do business with you. After using your products for a few weeks now, I am very pleased! First, I love your makeup! I have ordered samples and am now ready to purchase full-size. Do all of the sizes except samples come with sifter jars, or should I purchase the sifter jars separately? Thank you, Susan! All of our full size products come in jars with sifters for your convenience. No need to purchase jars (which also come with sifters) unless you want extras. Wonderful and thank you so much I appreciate your help!!! I have been doing a lot of research on mineral foundation and by far your website has been the most insightful of all I have viewed. I have placed my order. Hello! — I am loving your minerals! Was wondering, will they work in a brush or sponge applicator? I like to put the foundation into an easy-to-use applicator though I’m still looking for one with all-natural bristles! and didn’t know if you have any suggestions from anyone who has tried to use your products in that way before. Thank you for the compliment, Beth. Yes, our minerals work great in a dispenser brush and with a sponge applicator. Below is how one client uses a cotton ball. I wash and then gently exfoliate my face and use a toner. Then I apply moisturizer, wait a minute, apply Key’s Sunscreen, wait another minute, then apply your mineral powder foundation. I use a big fluffy organic cotton ball to buff it into my skin. This way the powder doesn’t fly into the air and up my nose (like with a foundation brush) making me cough. I don’t really need to spritz it if I have sunscreen and moisturizer underneath. It wears very well (even in heat), and the coverage is definitely full! Thanks for your help! I really love the foundation and I like being able to formulate my own blend. I love that this foundation can be used for longer than a year. I like that it will not come off if it gets wet and I blot off the water. I like the way my skin shows through, but not my rosacea. Again thanks for the great products! I just wanted to tell you how wonderful your products are! I heard about your company from Pink Truth. A lot of the regulars there like your products and you are getting good word of mouth from them. I have also began passing your cosmetic line onto my friends. Keep producing your amazing products and we will keep spreading the word! Thank you! I really do enjoy your products and have recommended them to my friend who ordered with in me in this current order. You’re the best, and I look forward to a great continued relationship with you in the future. I’m loving the sifters that are now on the sample jars! I absolutely am loving Beauty Bliss overall. …Anyway, thanks for making such quality products at such reasonable prices! Thanks for all the research you have done on mineral makeup. 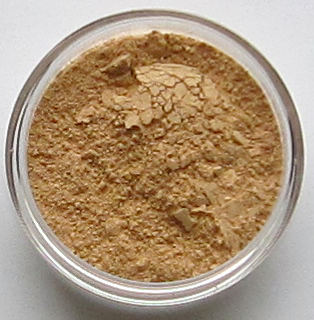 I have been on a 2 year search for mineral makeup without either mica or bismuth oxychloride. I enjoy your Matte formulation because of this. Although the clay dries me out a bit, it is worth the sacrifice in light of all the suffering both mica and bismuth oxychloride have caused my skin!! I had given up mineral makeup, but then, thank God, I stumbled across your website and saw the words “no mica or bismuth oxychloride.” I couldn’t believe it, and I still can’t. Thanks so much, Lynn! I appreciate all you have done! Due to this, we have removed the kaolin clay from all our foundation formulas and replaced it with Rice Powder which is less drying but still offers oil control. Lynn, YOU ARE REALLY REALLY GOOD AT WHAT YOU DO!!!!!! MIX ONE IS HER COLOR!!!! She mixed a slight hint of mocha (which we already had a sample of) with it and IT WAS PERFECT!!!!!!!!!! Flawless, it flows seamlessly into her skin!!! So, my roomie and I are definitely happy campers! Thank you, thank you, thank you, thank you again! Thank you, Girls! In trying to help these ladies find a dark enough foundation color for Ashanti’s skin (Takiyah mixes Honey and Mocha), who were told by 3 different Sephora reps that African American women would not be able to wear mineral makeup, we made a match. If you’re like Ashanti, please look for our newest foundation color “Ashanti” later this month. OK, I don’t how you did, but this make up is great! I just received my samples in the mail today and tried them out for the first time. I got both the original and matte foundations and just tried the original tonight. I am more broken out than usual right now probably due to the Bare Minerals and your make up has covered it all up! I don’t know how it achieves more coverage yet looks like I’m barely wearing anything at all. Plus, I am finally experiencing that “flawless” and “airbrushed” look that Bare Minerals promised but didn’t deliver on. I will say the colors looked a little funky when I first applied them but if you let it just sit for a minute or two, they magically transform to look great! As soon as I decide which foundation I want, I will be putting in a good sized order and switching exclusively to you! The real test will be in the morning when I go to work out. Thanks so much for taking the time to create this line! Great job! I just received my samples yesterday and I am loving them. The colors and the texture are amazing. And thank you so much for the speedy delivery. Have just placed my 3rd or 4th order. I love your foundation. I don’t itch!! Well done!!! Matte Bare is the color I have been seeking for so long. As an independent business owner myself, I wish you great success in your business. I LOVE your products! Eyeshadows stay true without creasing ALL day. Colors are fantastic. And your mineral foundation is the best I’ve tried yet. Coverage is awesome…a little goes a long way! Thanks for a fabulous line of cosmetics!!! By the way, I love, love, love your products. I was using aromaleigh for a while, but your powder gives me much more oil control and coverage. Even after using accutane, I’m pretty shiny by midday (I know, I know - count your blessings. You won’t have wrinkles), so this stuff is awesome. I even played soccer in the darn stuff one day when I was broken out a bit, and NOTHING budged. It was amazing. I am absolutely in love with Beauty Bliss! Shipping was ultra fast, I was gleefully tearing into my package two days after I ordered it! The colors are beautiful, healthy for my skin, and very, very reasonably priced. You have a faithful customer in me and I can’t wait to introduce all my sorority sisters to you! I just wanted you to know that I’ve been using your products for about three years now…it is the only make up I will put on my breakout prone face…it is wonderful and I don’t know what I would do without it. Thank you for the best make up I’ve ever tried and for committing yourself to quality! Hi, I received the samples today that I had ordered. I immediately went to the bathroom and put on the makeup. I love it! It doesn’t feel like I have anything on, but I look nice, not made up. I am definitely going to order again soon but this time the big containers of product…Thanks, your makeup is fantastic. I just wanted to let you know that I love your makeup! I have already made two orders and placed my third one today for my Mother-in-law. Soon I will be placing yet another order for my own Mother’s birthday. I am recommending you to anyone I know would appreciate your products. Thank you for a truly superior product line. I have sensitive skin that breaks out easily and can get quite oily on top of that and your products keep me covered, not smothered. I love them, I love them! The eyeshadows are gorgeous and I can’t wait to try some more. 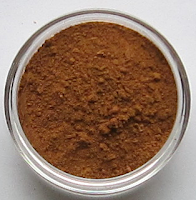 I love the sample option for all your products, I can try all sorts of colors for such a sensible price. 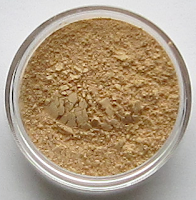 I can buy a sifter and combine my foundation colors for a custom fit for my skin tone. I love the purity of the makeup. I don’t even have to use soap at night, I just wipe my face with a damp cloth and don’t feel like I have heavy residue left over. It doesn’t aggrivate my acne and gives nice coverage. A truly remarkable product! Not that I am telling you something you don’t already know. I hope your company is around for a long time. I’ll be doing my part to keep you going! Thank you! I also wanted to let you know i ABSOLUTELY love your products,it didn’t make my face itch like the other products i’ve tried and glad i did some research and found your website and i love love love that you don’t have join a club and i love that you have just one foundation and don’t have to mix two different shades together just to get the right shade cause when it comes to that i’m a complete bonehead lol thank you again. I recently purchased a large order from you and I love your makeup! I think my skin looks healthier already. Thanks! I bought some of your products for my sister and she loves the mineral makeup. Now I’m getting a set for my other sister. And, soon, I plan to get more sets for my girlfriends. Thank you so much! I’ve received a package from you today. And thank you so much!!! And what a beautiful colors. I’m really grateful. Again,Thank you so much! Since I began using your products my aging skin has been in the best shape ever; fewer breakouts, better texture and less blotchy due to the great coverage. It is nice to have such quality products available locally. Buy the way, my sister, niece, and I lloovveee your makeup. I originally found out about your products as a gift to me from my sister, she raves about your makeup and so do I. Great colors and I do not break out from it, it lasts all day, I wore it for my wedding pictures. My daughter and I both LOVE your products. Thank you!! Thanks for everything - I love your company! Lynn:I just want to tell you how I am ecstatic, thrilled, over-the-top completely satisfied, mesmerized by you! I’m 58 and have been trying all different kinds of mineral makeup for the past ten years. Youngblood, Natural Mineral wand I forget the name, Aubrey, Neutrogena, Almay … on and on. I received your ample samples and am literally blown away! Your yellow concealer made my dark circles VANISH as well as the red veins that have always been visible around my nose and nostrils. GONE! The shadows are exquisite, the foundation flawless. My skin is soft, hydrated, smooth and young-looking. Your products have taken 10 years off my appearance! I will soon be ordering more and am declaring my life-long relationship with your company. Thank you, Lynn, for your intuition, your savy, and your contribution to us all. I absolutely love your products! Do you think you will ever offer your products in a pressed form? I travel a lot for work and the loose powders can get a bit messy on the road. If you ever consider offering a pressed version, I would be the first to in line to buy them. Love the new site, too. Have a great day! I love your mineral makeup and tell all my friends about it! My future daughter in law ordered some foundation and said her skin problems are disappearing! Thanks for a great product. Hi, I am very new to mineral makeup and have been sampling products from many different companies. I want to say that so far, yours has blown the others away. I was having trouble with minerals sticking to the dry patches on my face but not yours. I think it is because you have dry skin yourself. 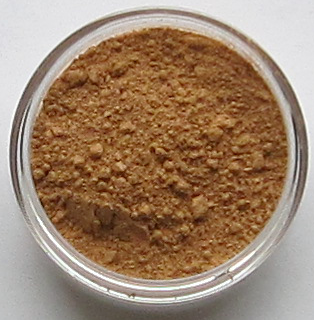 I also like how your minerals make the skin look dewey … I’ve received so many compliments! My skin is sensitive so I need to test a few more days to make sure I don’t have any reactions. If all goes well, you will have a customer for life. Loved my samples and I can’t wait to receive my new selections! Thanks for the great site. This was my first go around with mineral cosmetics and I received so many compliments on my makeup/skin. im lovin your products! especially as i can keep trying out new shades! Hi Lynn, I just wanted to drop you a note and tell you how much I am loving the samples I purchased from you. I had worn Bare Minerals for several years and liked it until it started making my face itch and burn. I decided I’d go back to trying some regular department store foundations, but that was a bad idea. It’s too expensive and it looked horrible on my face. I read about your business in the Tri-City Herald and it took me a really long time before I made my first purchase. I absolutely love your product and have suggested it to all of my friends. Thanks for making a great product. Thank you so much! It is very very hard for me to find the “right” colors cause my skin is really ……. well its hard. I REALLY love your foundation too and I also found a perfect color in that as well. You have no idea how many brands and colors I have tried. You really have a great product. Lynn, I just have to tell you how much I love your mineral foundation. I got my second and third orders yesterday. And I placed one more order so my daughter could have her own foundation set. I have sold cosmetics for years and only one time did I find one (and it isn’t the one I sell now. or that covered and had true oil control.) foundation I loved. But had to quit using it because it became too expensive. Plus I sold another cosmetic line. I always believed that if I sold it I must wear it. Until I found your website, I would have never tried anything else i (I did want to try minerals but because of what I sold that was something I just couldn’t do.) Anyhow sorry this is rambling so. Still, at 39 I have oily and very acne prone skin and so does my daughter. She has eczema to that flares up in the winter. I can already tell a difference in how my skin and hers looks. The coverage is great, I have some dark spots from the acne scars and it just covers without being heavy. So I just want to thank you again for making such a great product!! Thank you Thank you!! p.s. My daughter loves it. It is so easy for her to put on. No makeup line! Yea!! Thank you so much, Lynn! I absolutely love your products! They make a huge difference in my skin. I am absolutely in love with your products. They have been wonderful for my skin and am very pleased with the finished product. You also have a wonderful array of colors that I look forward to trying out a new look everyday. Just wanted to let you know I received my samples last week and have been trying them out. I had been using Bare Escentuals for about 5-6 yrs. I am really happy with your makeup. I’m enjoying trying the different samples. I definitely will be ordering some full size product, and some more samples. I passed you article in the Herald, and website to a friend in Longview, WA and she is in the process of choosing her samples too. She was also a loyal BE user. I am loving the Sand Eyeshadow! Thank you for such a great product. I was reading all the rave customer comments on the Beauty Bliss blog and decided to write one of my own. There is so much to be said about this mineral cosmetics, and all the praise, I believe, is from my objective standpoint. Because I’ve tried other makeup brands, including Clinique, Loreal, and Maybelline, but nothing has worked as great as Beauty Bliss Cosmetics. I also tried Everyday Minerals, but it didn’t cut out on my sensitive/combination skin, possibly because of the mica. So thank you for such a great product–I’ve had some problems with application along the way, like having it dry out my skin because I didn’t moisturize enough, but the makeup itself is divine. I admit I have only bought the sample jars in the past because I’m the type of person who likes to keep makeup minimal, but even when I opt for full coverage, I don’t have to use a lot of this mineral foundation! So thank you again, and I hope the formula remains just as pure as it is now, without unnecessary ingredients. Honestly, it is the only brand of cosmetics that doesn’t make my face erupt in cysts or pimples. Thank you for a great product. I’d almost given up on finding a mineral makeup that didn’t make my face itch and break out. I have fair and sensitive skin and within the last few years it has been all over the place. I’d been using Pur Minerals as well, and liked it however I kept getting itchy red bumps on my face which had never happened before. I have mild acne and PM worked well at covering them but it was the PM itself that was causing them. I didn’t know why and wish I knew sooner. samples. It has been a few weeks and they have worked great, no more itchy face or bumps and my skin is smooth and healing. And it all looks natural in every light! Wonderful! I just placed an order for full size and am very happy that I have found something that works! On a side note, I have switched almost all of my products (hair & facial products, deodorant, etc) to all natural ones, all of which make a big difference to my sensitive skin. 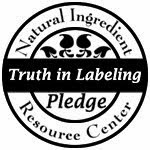 Every little bit helps and it is good to know that there are products out there that do not harm you. I think you have a gr8t product that those of us who hate chemical crap need to know about. GREAT PRODUCTS by the way. Love them - amazing that little puffy minerals can do so much good! loved the samples and im back for more. this makeup is amazing! thanks again. Thanks for offering samples - I have been wanting to try mineral foundations. Your info is very helpful. I love your product–so much better than Bare Minerals! I had to use up my old stuff first but from now on I’ll be a loyal customer. I just wanted to let you know that I’m so pleased with your products, and am looking into ordering some of your items again. Thanks…It’s so good to know their is a mineral line which I love that I can always rely on and really trust! Thanks so much for everything! It’s truly great to know that there are people like you who produce makeup that’s so gorgeous, yet still wonderfully safe. Women and girls all over are very blessed! Thank you for the product shipped. I tried it today and think it is an awesome product! I can’t wait to use it on our dancers. I perspire easily and was amazed that with just blotting the make-up it still looked fresh! Firstly complements on a great sight & super fab cosmetics. Thankyou & once again congrats on such a great business. Thank you so much for offering this make up. I have been using bare minerals for a bit now and just like you say in your articles it does rub off and look bad when its hot and I sweat. Plus it contains all that gross stuff that your make up does not. So thanks again, the colours are amazing and I am so excited to receive this new make up to try the samples and hopefully come back for more. Thank you for having these available to test. I am a Make-Up Artist and am always trying to find ways to stay away from the harmful products that are out there. My clients(performers) will be pleased to try the new minerals. Again I thank you and I look forward to receiving product. I wanted to use the products for a while in order to fully evaluate them. I think your products are GREAT STUFF! I love the ease in which the foundation can be applied. I can do just a quick cover up to run to the store, or take a little extra time & look great for a special occasion. Only takes a second to do a quick touch up throughout the day too. My face feels smooth & moist, looks natural (and is with this natural product! ), & I have received a lot of compliments so far. The ease of ordering & quick response from you even in the middle of a move from one state to another was impressive. Thank you so much for working with me to get the proper color match & sending me some choices of samples. I like the fact that I can order one item at a time if I want to, & not have a minimum order, or have to be on a reorder list like some of the larger companies, & the fact that your products don’t contain some of the undesirable ingredients that theirs do, & at a lesser price! You have a wonderful company there so keep up the good work! Hey I got the samples and love them. 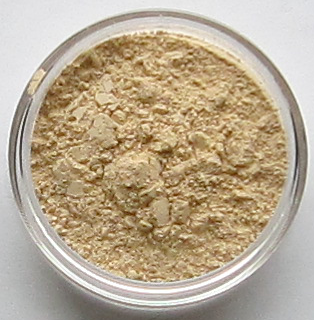 This is the best mineral makeup. I love how its really does not take much for my whole face. I will be ordering the full sizes soon. Thanks for a wonderful product! I used another mineral makeup for several years. My face itched like crazy when I was hot. I thought it was just me. Then I found your site & figured out it was the bismuth. Since using your products, my skin is clearer & much more comfortable. I would recommend it above other mineral makeup to everyone! I just wanted to say that I’ve tried some of the more commercial brands of mineral foundation, and could never really understand the hype. They made my skin itchy, more oily, and shiny. As a medical esthetician, I wanted so badly to like them! 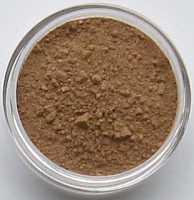 I have to say that your mineral foundation is the best I’ve tried so far. It gives moderate to full coverage and still looks natural, not cakey! Plus it stays on my face all day, and I’m usually a greasy mess by noon! Thanks again! Your foundation can last through a 32 mile run! That might be too crazy of an endorsement to put online, but it's true!